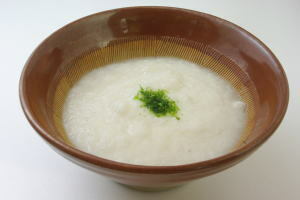 Tororo ('とろろ', is classified into appetizer), is known as Grated Japanese Mountain Yam in English, and 山药泥 (Shānyào ní) in Chinese. It is the washoku. Grated Yamaimo, Grated Dioscorea Japonica. Dashi, Soba Soup, Soy Sauce, Nori Seaweed. Tasty (A little salty and sweet).